Walking is the most basic form of transportation. Most trips, whether they are taken by a car, bike, bus, trolley, or train, all involve walking at the beginning and end of the trip. Unlike these modes, however, walking by itself does not require the individual to pay fares, user fees, operating or maintenance costs. Pedestrian infrastructure is significantly less costly than that of its counterparts, and the amount of space required to accommodate a pedestrian is also much less. Unfortunately, many current land development practices and transportation investments greatly underutilize or completely ignore pedestrians in their investments, especially in places with greater mixes and proximity of land uses where walking to destinations would otherwise make sense. 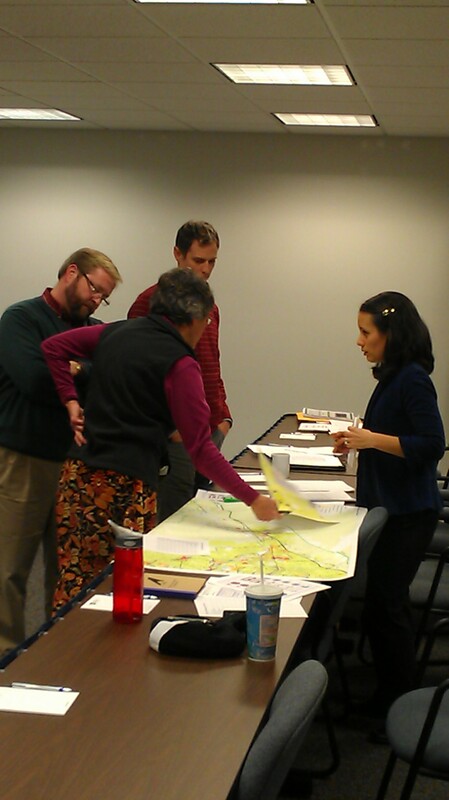 The Roanoke Valley Transportation Planning Organization (RVTPO) and member local jurisdictions have joined together to develop a plan to improve walking as a mode of transportation in the Roanoke Valley. 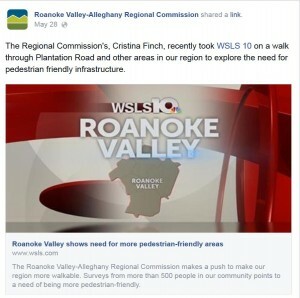 The Regional Pedestrian Vision Plan for the Roanoke Valley Transportation Planning Organization (herein referred to as the Pedestrian Plan), is the region’s first plan focusing specifically on promoting walking for everyday trips. With limited financial resources for pedestrian improvements, this plan identifies where pedestrian infrastructure investments are most needed based on the number of potential residents, employees, shoppers, diners, and other visitors to walk to access nearby destinations. The purpose of the Pedestrian Plan is to provide a coordinated and strategic approach to making walking a more widely chosen form of transportation. Through the development of a regional pedestrian network, safe and attractive walking environments can exist to enable people to accomplish their daily tasks with greater ease. 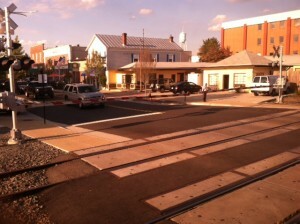 In October 2013, the Virginia Department of Rail and Public Transportation published guidance for developing and designing multimodal transportation systems throughout the Commonwealth of Virginia. As such, the “Multimodal System Design Guidelines” (MMSDG) provided the framework for developing this Pedestrian Plan. With this Plan as a foundation, it is expected that all transportation decision-makers, engineers, designers, planners, development reviewers, inspectors, and infrastructure maintenance staff will work to build and maintain the envisioned regional pedestrian transportation network so that walking conditions will improve greatly in a short time period as current practices and investments are adapted to create a more livable Roanoke Valley. Along with the development of the Pedestrian Plan, several other efforts are taking place, which may not be completed by the Plan’s adoption, yet in their draft form have had great influence on it. 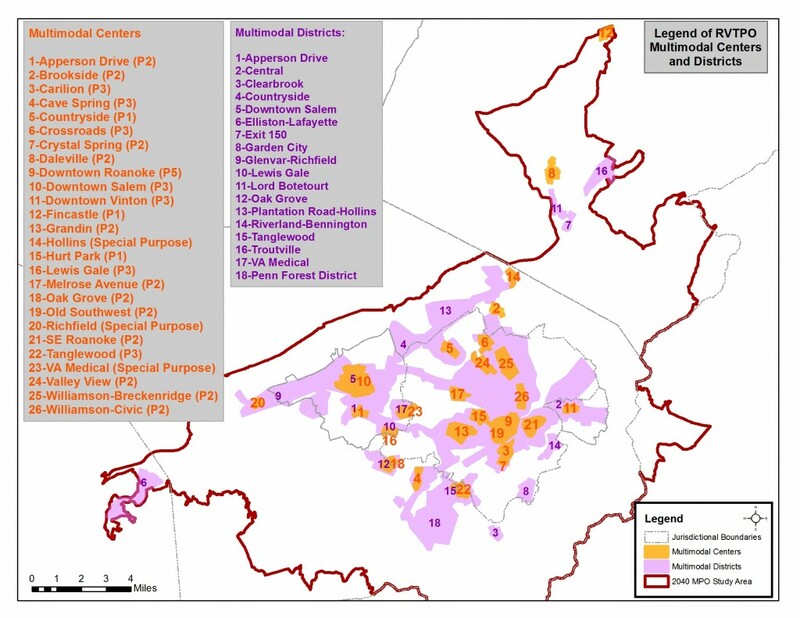 As recommended in the MMSDG, and in preparation for the next CLRMTP, the RVTPO Transportation Technical Committee has been working to identify multimodal districts, centers, and corridors for the RVTPO study area. Multimodal District: Any portion of a city or region with land use characteristics that support multimodal travel, such as higher densities and mixed uses, and where it is relatively easy to make trips without needing a car as gauged by the number of bus routes available, and safe walking or biking paths – either currently or proposed in the future. Multimodal Center: A smaller area of even higher multimodal connectivity and more intense activity, roughly equivalent to a 10-minute walk or a one-mile area. 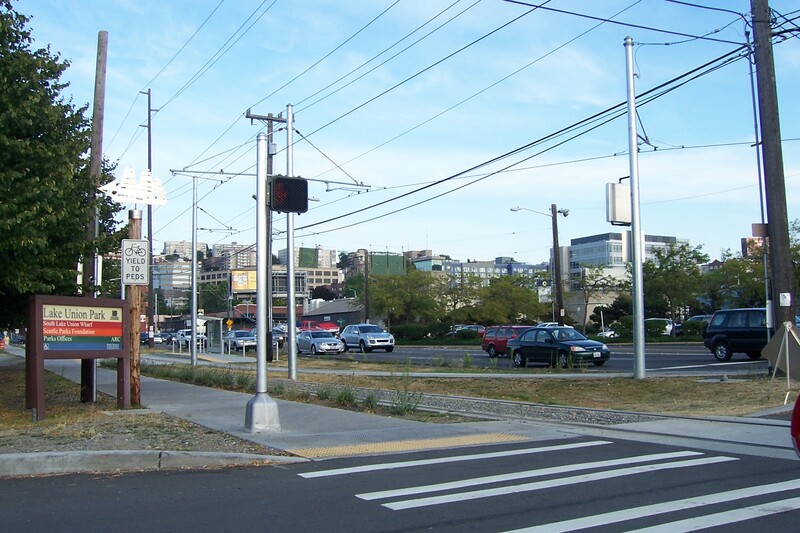 Multimodal Corridor: A public right-of-way that accommodates multiple transportation modes and includes the adjacent land between the multimodal facility (roadway or pathway) and the buildings. The MMSDG include six corridor types: Multimodal Through Corridor, Transit Boulevard, Boulevard, Major Avenue, Avenue, and Local Street (see Appendix A for definitions from the MMSDG). At this time, only the corridor types Multimodal Through Corridor, Boulevard, Major Avenue, and Avenue have been drafted for the region. 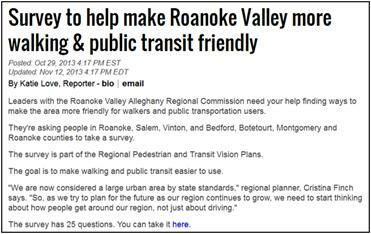 Neither Transit Boulevards nor Local Streets have yet been identified for the Roanoke Valley. These multimodal concepts (districts, centers, and corridors) have shaped the recommendations of the Pedestrian Plan and will ultimately guide the recommendations of the CLRMTP. Preparations have also begun to form VTRANS 2040, the next Statewide Multimodal Transportation Plan. This plan will be developed by the Secretary of Transportation’s Office of Intermodal Planning and Investment in conjunction with the state’s transportation modal agencies. 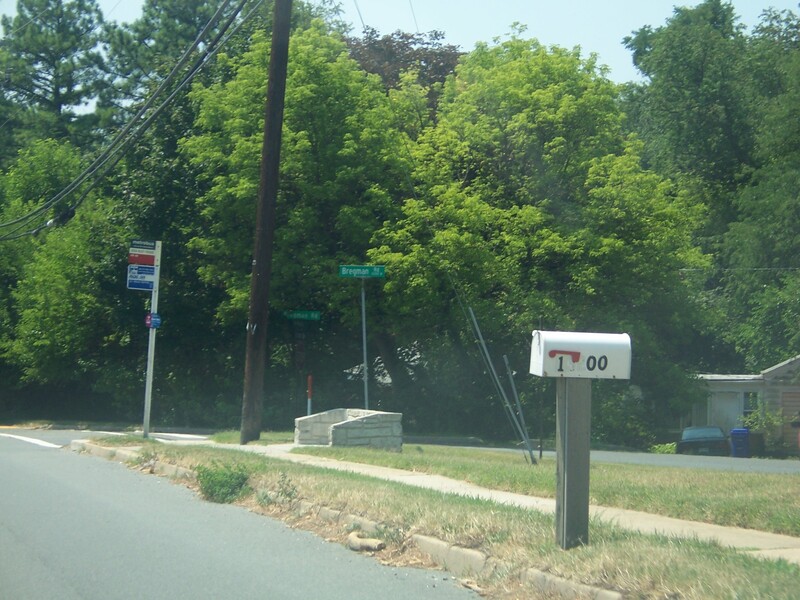 In 2004, the Commonwealth Transportation Board (CTB) adopted a Policy for Integrating Bicycle and Pedestrian Accommodations in the funding, planning, design, construction, operation, and maintenance of Virginia’s transportation network. VDOT has followed up on that Policy by developing a Plan to clarify the Policy, provide staff with resources, improve outreach and coordination, and measure and evaluate progress. The Pedestrian Policy Plan was published in September 2014. It is an excellent resource outlining Virginia’s existing policies, guidelines, processes, and programs. The Policy Plan provides the vision and goals for the future of pedestrian accommodations in the Commonwealth and recommendations for achieving them. The Pedestrian Plan cove rs the Roanoke Valley Transportation Planning Organization 2040 Study Area which includes the Roanoke Census Defined Urbanized Area and the contiguous geographic area(s) likely to become urbanized within the 25 year forecast period covered by the CLRMTP. 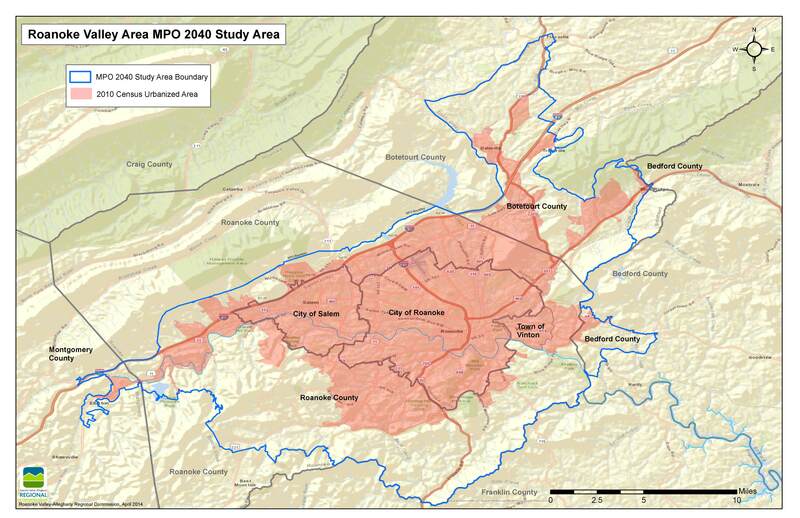 Localities within the RVTPO Study Area include the cities of Roanoke and Salem, the towns of Fincastle, Troutville, and Vinton, and portions of Bedford, Botetourt, Montgomery, and Roanoke counties. 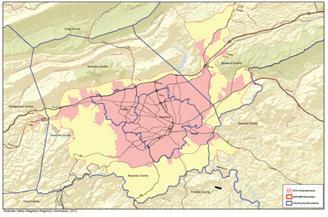 Figure 1 shows the TPO Study Area boundary (yellow), Roanoke Urbanized Area (pink), and the jurisdictional boundaries (blue). The Regional Commission, because it provides the staff for the RVTPO, has taken on the role of facilitating the Pedestrian Plan’s development through the cooperation and involvement of interested stakeholders. 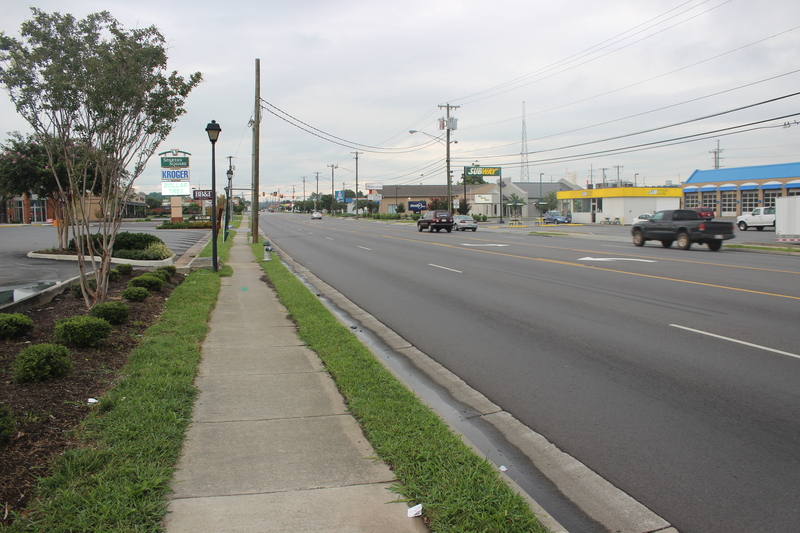 The Commission, with the help of local governments and VDOT, is responsible for assessing progress towards the regional pedestrian vision via established performance measures. While the Pedestrian Plan is intended to facilitate, promote, and provide general guidance on improving walking conditions in the region, within the TPO Study Area, the local governments and the Virginia Department of Transportation (VDOT), because they authorize new construction and maintenance activities within public right-of-way, are the ultimate responsible parties for ensuring the implementation of the recommended pedestrian infrastructure improvements. Valley Metro and the Greenway Commission are responsible for working with local governments to pursue pedestrian improvements related to public transit and greenways, respectively. The RVTPO Policy Board is responsible for approving federal funding for pedestrian projects consistent with the region’s pedestrian vision. An Urbanized Area is a statistical geographic entity, designated by the Census Bureau, consisting of a central core and adjacent densely settled territory that together contain at least 50,000 people, generally with an overall population density of at least 1,000 people per square mile. The Roanoke Valley is a livable community, proud of its outdoor amenities and recognized for its outstanding quality of life. 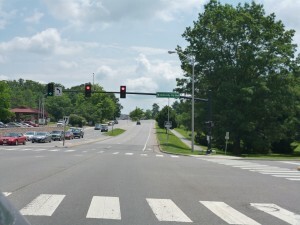 As such, the residents and employees of the Roanoke Valley envision a safe pedestrian environment where walking is an integral part of daily life; nearby destinations are well-connected by pedestrian facilities that are conveniently located and well-maintained. Like other transportation modes, is constructed and maintained as a natural, routine part of the regional transportation system. Overwhelmingly, Roanoke Valley citizens value walking and feel that walkability (how friendly our region is to walking) is important. 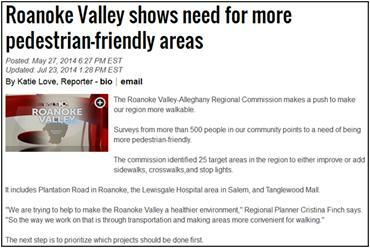 When considering the ability to walk, the Roanoke Valley values safety, accessibility, health and mobility. It is important to be able to walk somewhere safely. It is important to be able to walk around one’s neighborhood and to walk to nearby destinations such as jobs, schools, libraries, and grocery stores. It is important to be able to walk for health and well-being. It is important to be able to walk as an alternative to driving, especially since many people do not drive. Walkability is most important in dense areas; elsewhere it is important where it is wanted and warranted. Walkability is important because being able to walk around provides a sense of connectedness and community. Walkability is important because it encourages downtown development and development within regional multimodal centers and districts. Walkability is important because it supports tourism development. Walkability is important in order to enjoy our regional history. Walkability is important for the environment; it reduces the number of vehicles on the road, thus reducing vehicle emissions and air pollution; it reduces the need for parking, as such, impervious surfaces and storm water runoff is reduced. Walkability is important in order to enjoy our Valley’s viewsheds. Goal #1: Improve SAFETY for pedestrians. More people are seen walking in the Roanoke Valley because they feel safe due to new infrastructure which makes walking safer for people. Goal #2: Enable INDEPENDENT MOBILITY, particularly within multimodal centers and districts, where people do not have to rely on personal vehicles to get from one place to another. Walking is an easy decision because it is a pleasant experience. Goal #3: Create a region where ACTIVE LIFESTYLES are the norm because our land use decisions and investment in transportation infrastructure complement each other and enable a natural tendency for people to walk every day. As a result, people feel healthier, more socially-connected and happy living and working in the Roanoke Valley. Goal #4: Increase BUSINESS in multimodal centers and districts; they are enjoyable places to work and patronize in part because they are in attractive well-connected walkable environments. Goal #5: Clean the ENVIRONMENT by walking for more trips and driving less. The Roanoke Valley is an attainment area for air quality, and we want it to remain as such even as we continue to grow in population. As more citizens walk to accomplish everyday tasks, they are able to enjoy the Valley’s beautiful environment. An attainment area for air quality is an area that meets the primary or secondary ambient air quality standard for the pollutant. The Pedestrian Plan’s development began with a review of past work, including policies and plans, related to walking and pedestrian improvements. The Pedestrian Plan benefited from the input of citizens, local technical staff, and decision-makers throughout its development. The combination of these perspectives defined the region’s values towards walking, its vision and goals. Technical staff used citizen input and the previous plans information to formulate the Pedestrian Plan’s infrastructure recommendations and strategies. The final Pedestrian Plan is adopted by the TPO Policy Board, which represents the seven jurisdictions that encompass the urban Roanoke Valley. The public had several opportunities to provide input to the Pedestrian Plan. Citizen input provides the rationale for planning and making investments in pedestrian infrastructure and was valuable in the development of the Plan. Over a four month period from September–December 2013, citizens had the opportunity to provide feedback regarding why they value walking, how often and why they walk, and where they think improvements to pedestrian infrastructure are needed. Citizens shared their most pressing thoughts on walking with decision-makers. Surveys were conducted in person, on paper, and electronically. Citizens were notified of the survey opportunity via numerous sources which are listed in Appendix B along with the survey results. In addition to the public survey, coordination with other meetings and events enabled greater input. The City of Roanoke maintains plans for each neighborhood in the City. Concurrent with the Pedestrian Plan, the City has been undertaking an update to the Downtown Roanoke Plan. On September 11, 2013, a public open house was held to allow citizens to provide feedback on their desires for the future of Downtown Roanoke. At that event, staff provided displays and administered the public survey via paper, computer, and personal interviews with participants. On September 27-28, 2013, the Senior Citizens Coordinating Council conducted an Open House at Greene Memorial Methodist Church featuring member non-profit organizations and information sessions for the public. The event provided an opportunity for staff to talk with citizens and staff from other organizations about the Pedestrian Plan. People noted locations where pedestrian facilities are needed on large maps. Many people also filled out a public survey during the two-day event. The RVTPO Transportation Technical Committee served as the Pedestrian Plan’s Steering Committee. Updates, group discussions, and decisions took place during regularly scheduled monthly meetings of the TTC in addition to the typical agenda. Additionally, on several occasions throughout the Plan’s development, staff met individually with local government staff to review technical details and recommendations. The Committee was provided content for their review a week prior to meetings for review. Below is the timeline of TTC activities which has resulted in the Pedestrian Plan. Values: Is walkability important to our community, why/why not? Vision: What do we want the future to be? Goals: What goals should the region have for walkability? Do you agree that the locations identified on the maps per the public comments and previous plan recommendations for proposed intersection, sidewalk, streetscape, off-road, and greenway projects are locations where infrastructure is needed? Where else are on- or off-street pedestrian connections needed, particularly within and between multimodal centers and districts? Localities were provided tables and maps of the recommended projects and asked to prioritize each project from the locality’s perspective based on the determined ranking system of low-medium-high. The TPO Policy Board had a unique opportunity to help shape the content of the Plan and the course of the planning process through discussions and visioning activities conducted during regular meetings. On two occasions, WSLS 10 featured work being undertaken as part of the Pedestrian Plan on TV broadcasts and their online news feed. The October 29, 2013 broadcast advertised the public survey. 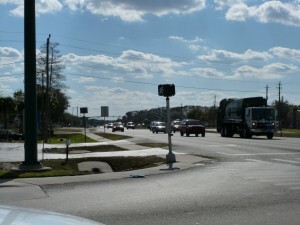 The May 27, 2014 broadcast highlighted work to define multimodal centers and districts as well as provided two example locations in the region where pedestrian accommodations are recommended, the area around the Lewis Gale Medical Center and Plantation Road between Exit 146 and Williamson Road. The May 27 broadcast was also publicized on the Regional Commission’s facebook page. It is unrealistic to expect that all parts of the Roanoke Valley will be retrofitted or newly developed to be pedestrian active places. The region is mountainous and often the landscape causes significant challenges to developing walkable environments. However, places like San Francisco show that where there is an interest and a demand, walkable environments can be created in any terrain. In the Roanoke Valley, much land has already been developed at low densities with the intent that people should only drive to get to and from those locations. Trying to retrofit these areas to provide walking infrastructure is an expensive and difficult task. Unfortunately, adding pedestrian infrastructure to an automobile-oriented development may meet safety goals, but often results in an environment that is still less walking-friendly than if the location were developed with pedestrians in mind from the beginning. 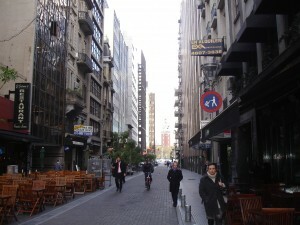 In the example shown in Figures 2 and 3, two types of development exist along the same street. Both developments feature sidewalks and decorative lighting, yet the number of people who walk in these places varies greatly. The reason is solely due to the land development patterns. The buildings in Figure 2 are closer to the sidewalk with front doors accessible from the main sidewalk. 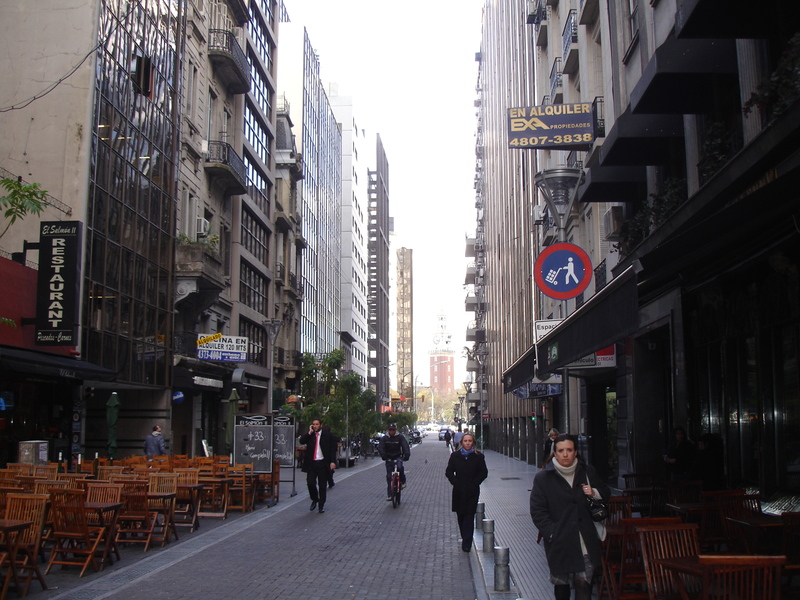 The road is more narrow thus easier to cross, and vehicle parking exists on-street, next to, or behind buildings. In contrast, the buildings in Figure 3 are located farther from the sidewalk, and parking lots are built in between sidewalks and buildings. The road is wider and designed primarily for the movement of vehicles with no on-street parking. Figure 2 clearly shows a place that was developed for people while the environment in Figure 3 was developed for cars. New developments within the Roanoke Valley urban area are being designed and constructed for people, acknowledging that people enjoy walking to places. The picture below shows how the Daleville Town Center, a mixed-use development in Botetourt County, is being developed for people and marketed for its walkability. The City of Roanoke, as part of its revised zoning process, now requires new commercial buildings to be constructed near the street with parking to the side or rear, making the business easily accessible to people from their car or from the sidewalk. One example is the New Horizons building recently constructed on Melrose Avenue shown in the following figure. During the site’s development, City staff worked with the developer to ensure that pedestrian connections (via a sidewalk and a staircase) were made from the building’s front door to the main sidewalk which also connects to a sheltered bus stop. The parking was conveniently located to the side of the building. The result is an attractive business, visible to passersby, that is easy to access via many modes of transportation. 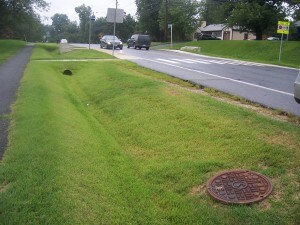 LOCAL GOVERNMENTS HAVE A GREAT RESPONSIBILITY TO MAKE CONSCIOUS DECISIONS ABOUT WHAT THEY ARE PERMITTING WITHIN THEIR BOUNDARIES INCLUDING THE TYPES OF DEVELOPMENT, WHERE THEY ARE LOCATED, THEIR DESIGN AND CONFIGURATION ON A SITE, AND IF THEY INCLUDE PEDESTRIAN CONNECTIONS TO AND ALONG ADJACENT ROADS AND OFF-ROAD TRANSPORTATION CORRIDORS. As part of a long-range planning exercise, the desire to make some parts of the Roanoke Valley friendlier for walking led to a review of the density of people throughout the region. The distance between where people reside or work and where they need or want to go is a critical factor in people’s willingness to walk to accomplish that trip. Transportation investments in pedestrian infrastructure are most warranted where they have the potential to make walking trips easy for many people. To help identify the region’s multimodal centers and districts, the concept of activity density was mapped. Activity density is defined in the Multimodal System Design Guidelines to be the number of residents plus employees per acre. This concept can be applied to any place in the Commonwealth. 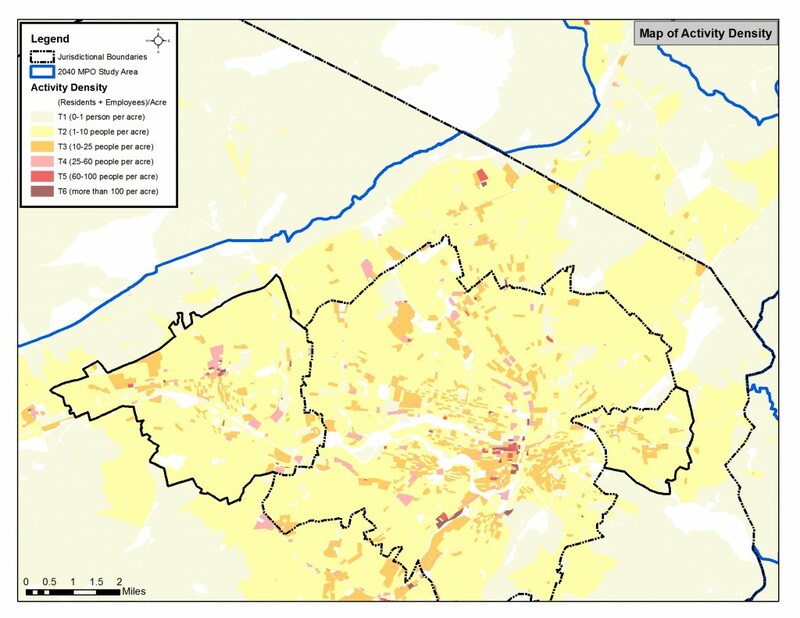 The purpose of mapping activity density is to show where the concentrations of people, and thus activity, are located, which therefore helps to identify where walking for trips is possible and likely. The proximity of people to places is one key determinant of whether or not someone would walk. As shown in Figure 6, much of the Roanoke Valley is low density with 10 or fewer people per acre. In many of these areas, it is not likely that people would choose to walk to get somewhere due to the longer travel distances. A focus on the areas with higher concentrations of residents and employees guides the recommendations for pedestrian infrastructure. In reviewing the activity density, along with local knowledge of destinations and the relationship between residential areas and businesses, technical staff defined regional multimodal centers and districts in which a key concept is how easy is it to walk within those places either now or desired in the future. Figures 7 and 8 show the region’s multimodal centers and districts. The legend in Figure 8 indicates an intensity classification for Multimodal Centers from P1 (Rural or Village Center) to P-6 (Urban Core). Is it a Sidewalk? Trail? Greenway? Pathway? Shared-Use Path? Multi-Use Path? Multi-Use Trail? While there are many words used to describe the surface on which people walk, for the purpose of the Pedestrian Plan, a simple hard surface versus natural surface distinction is made among existing accommodations. The purpose of this distinction is the hard surface accommodation can be used by anyone including people using mobility devices such as walkers and wheelchairs, whereas a natural surface accommodation may not be accessible to everyone. A hard surface accommodation is stable and slip resistant such as concrete or asphalt; a natural surface accommodation may consist of dirt or wood chips. Many times it is obvious where additional infrastructure is needed due to the presence of a dirt path along a road. 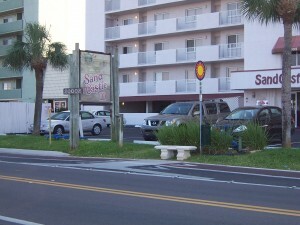 Other times the need for an accommodation is less obvious because people may be walking on roadway shoulders or through parking lots which do not display worn paths. People can often safely walk on local streets which feature no designated walking facility when safety precautions are taken such as drivers operate at safe speeds, walkers wear reflective gear and walk opposite to traffic, etc. In addition, pedestrian amenities such as crosswalks, curb ramps, and pedestrian signals exist throughout the Roanoke Valley and are in the process of being inventoried and mapped. Every traveler is a pedestrian at some point during their trip. The following sections relate the pedestrian to other primary transportation modes. Adequate pedestrian facilities, such as sidewalks, landing pads, and curb ramps enable people to ride public transit because they allow people to physically access bus stops and wait for the bus in a safe location. Without pedestrian facilities, some people will access the bus stop even under poor conditions; other people will instead drive their car, call for paratransit services, depend on another person for a ride, or not travel at all. Paratransit services support people with disabilities who cannot use the fixed-route system. These services are very costly because the service can only support a few trips per hour when compared with fixed-route service. However, it is impractical to suggest that people with disabilities try using the fixed-route service when they cannot physically get there in a safe way. Fixed-route service provides the option of freedom and mobility on one’s own schedule that paratransit service does not allow, which is the main motivation for people to choose fixed-route over paratransit. 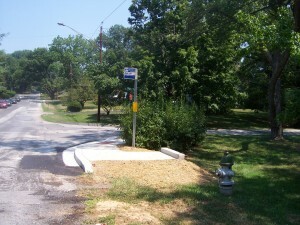 Many bus stops are not accessible due to lack of infrastructure. An investment in pedestrian access to the region’s bus stops is needed. People are more likely to choose riding public transit when they feel safe walking to the bus stop, crossing the street, and waiting for the bus. Pedestrian amenities at transit stops such as benches or shelters are essential because they make riding public transit a more comfortable and enjoyable experience. In some places where benches are not provided, people have resorted to building one themselves as shown in Figure 9. 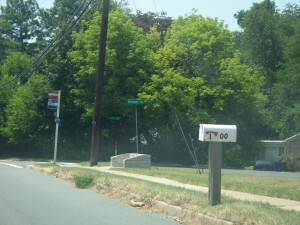 Figure 10 below shows a bus stop in front of Edinburgh Square, a retirement community in North Roanoke County. The location is one of many bus stop pairs in the region that lack adequate facilities including sidewalk connections, landing pads and curb ramps. In many places throughout the region, crosswalks are striped at unsignalized locations often specifically for crossings near schools or churches. To facilitate an integrated multimodal system, crosswalks to bus stops or to connect bus stop pairs should also be provided. 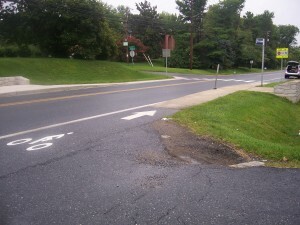 Where crosswalks are marked, curb ramps are also needed. 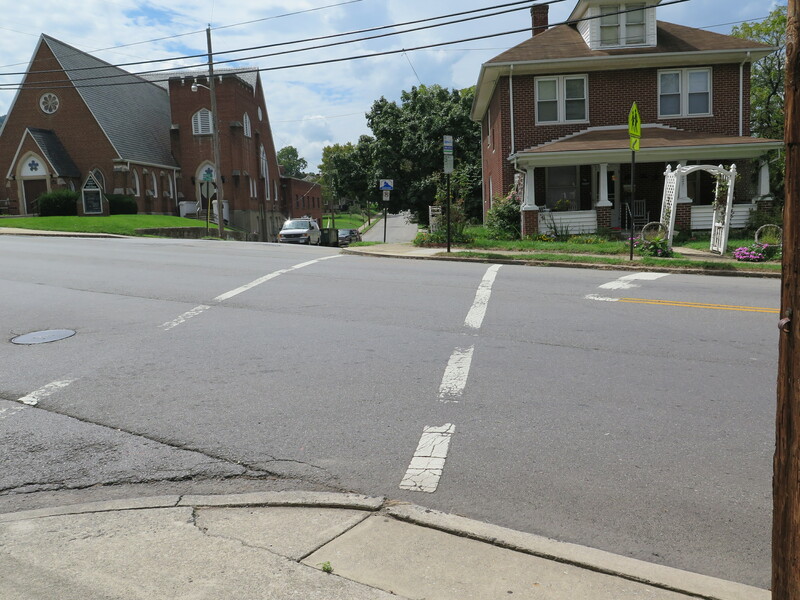 Figure 11 shows a crosswalk near a school and at a bus stop in need of a curb ramp. Figure 12 shows the need to connect pedestrian accommodations given that the curb ramps are located the corner and the crosswalk is midblock in front of the church. A bus stop is also present in front of the church. New pedestrian accommodations constructed next to bus stops should always consider accessibility, per the Americans with Disabilities Act (ADA), and incorporate landing pads at the bus stop. Such additions are a small increase in the overall cost of a project and can be accomplished easily during construction. Figure 13 shows a new sidewalk that will entail additional work to make the bus stop accessible because the space between the sidewalk and the curb at the bus stop was not paved and no curb ramp was installed to accommodate wheelchairs crossing at the intersection. Along streets where transit service is provided and on-street parking exists, a common conflict is the ability for a pedestrian to get from the bus stop onto the bus without having to walk between or around parked cars. If the bus stop does not generate sufficient activity, it may be preferable to relocate the bus stop and provide the space for parking. However, where bus stops generate activity and it makes sense to have them in a particular location, parking must be removed to allow people with disabilities to use the bus stop. Anywhere a bus stop exists, adequate space must be provided for the bus to pull up to the bus stop. A valuable resource for identifying the improvements needed at bus stops is the Bus Stop Accessibility Study completed by the Regional Commission in September 2013. The Study reviewed the most active bus stops based on their Bus Stop Activity Index, a factor of ridership and frequency of usage, as well as bus stops that were near high activity paratransit pick-up locations and recommended pedestrian improvements. Bicyclists and pedestrians are often lumped together for good reason as oftentimes infrastructure is constructed to accommodate both types of travelers in the same space. In the Roanoke Valley, this is most often done on paved off-road facilities, commonly referred to as greenways. 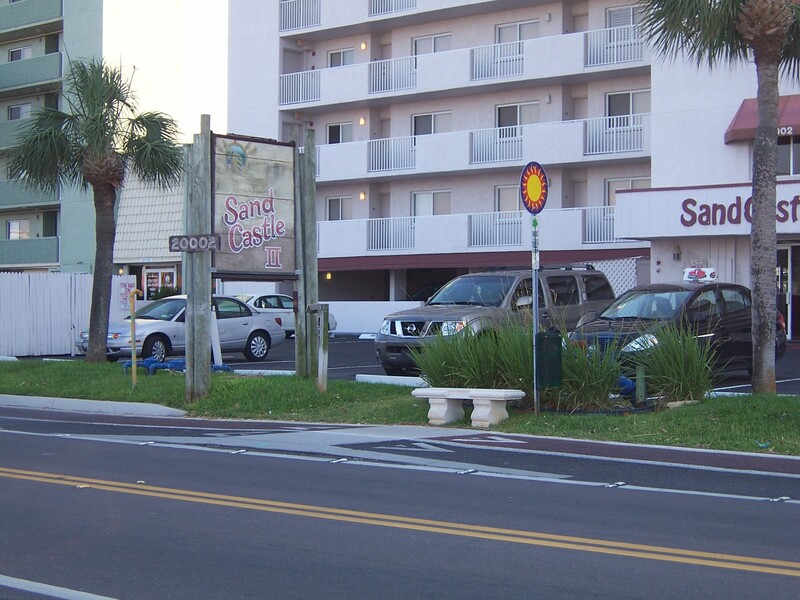 Although it is provided less frequently, the same accommodation can be located along roadways where a wide paved space is constructed for both bicyclists and pedestrians. The Multimodal System Design Guidelines generally recommend a shared space separated from vehicle traffic along higher speed and volume roads classified as Multimodal Through Corridors. 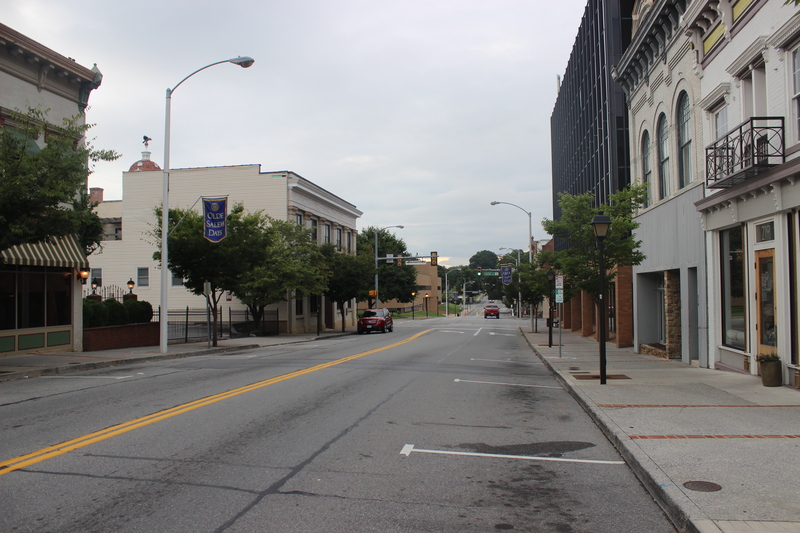 The City of Roanoke’s Street Design Guidelines also recommend shared spaces along arterial streets. 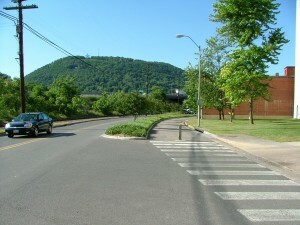 When the City of Roanoke provided pedestrian accommodations along Hershberger Road, a six-lane arterial that crosses over an interstate, the engineers designed a wider-than-typical sidewalk on one side to also accommodate bicycles. Due to the location, it was not desirable to accommodate bicycles on the street; instead, the engineers took advantage of the maximum amount of space available to coordinate improvements for both types of travelers. It is imperative that projects be approached with a holistic mindset to accomplish as many improvements as possible, particularly if the additional cost is not burdensome. 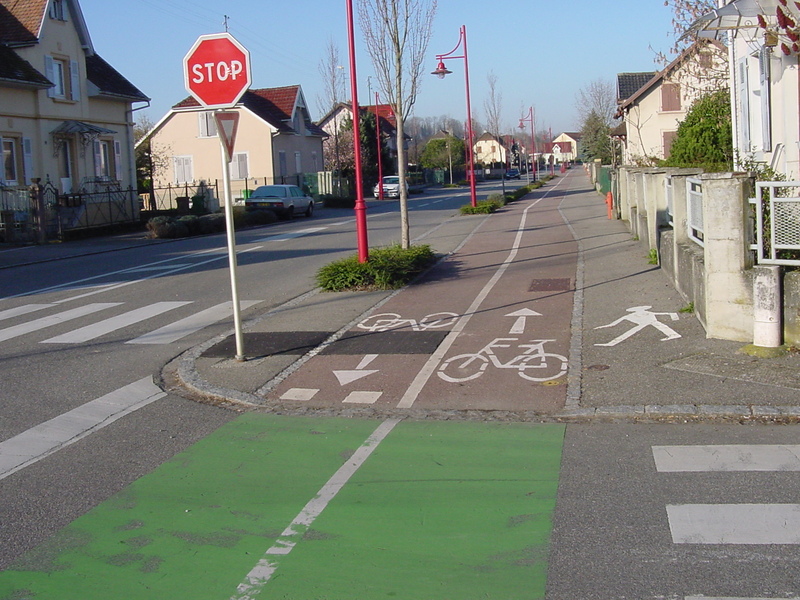 In other communities, shared bicyclist/pedestrian spaces are visibly marked. Such markings are helpful to instruct people that bicyclists and pedestrians are permitted to use the accommodation and to provide guidance on where each should travel. On-road bike accommodations have also become a place where people using motorized scooters will travel. Where sidewalks do not exist or are not accessible, people using mobility devices are required by law to travel in the direction of traffic, which often takes place on a roadway shoulder or in a bicycle lane. Places where this is occurring are good indications that new or improved pedestrian infrastructure may be needed. Every driver is a pedestrian as they walk from their origin to their vehicle and from their vehicle to their destination. 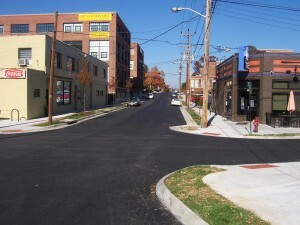 During site design of parking lots, in addition to providing a connection to the primary building, it is important for designers to evaluate the nearby destinations and the routes that pedestrians will likely take to get there so that infrastructure can be incorporated into the facility’s construction. When pedestrian accommodations are not considered in the design of parking lots and their connection to destinations, the result is locations inaccessible for people with disabilities, dirt paths worn from foot traffic, or additional short-distance vehicle trips. The ability for people to park their vehicle and walk the rest of the way is especially critical in Multimodal Centers and around regional venues where driving for short trips is not possible or desirable. 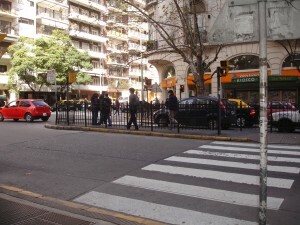 As mentioned in the Pedestrian–Transit section, a natural component of walking is the need to cross the street to get to one’s destination. 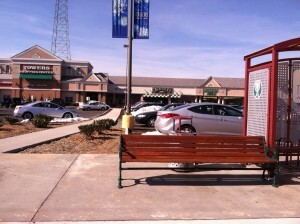 In the previous example, the destination was a bus stop, but more commonly, the destination is a building. 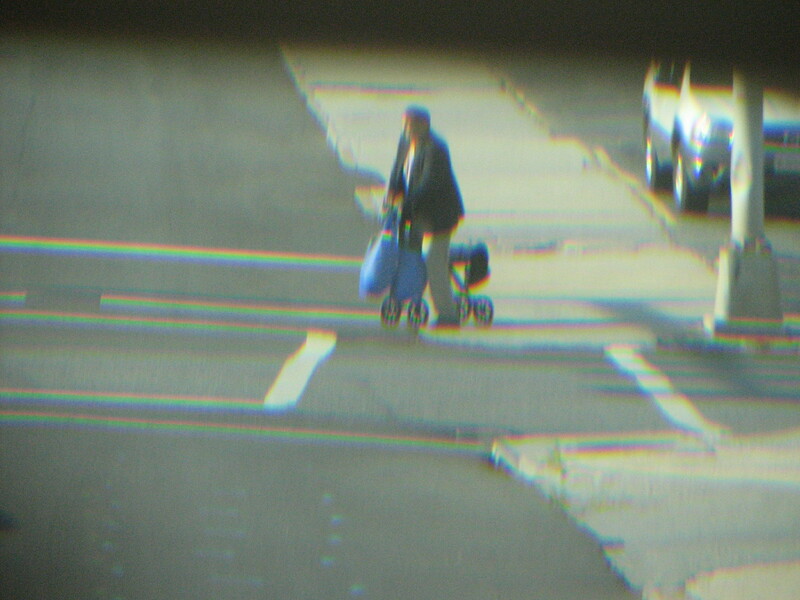 The picture below shows a person with a temporary disability traveling from their car to a nearby building. Fortunately, sidewalks and ramps exist to assist him as he travels. In order to avoid crashes, it is useful if drivers know where to expect to see pedestrians so they know to reduce their speed or stop. High activity crossings or places where pedestrian visibility is desired often feature simple amenities such as marked crosswalks, walk/don’t walk signals, flashing warning lights, High-Intensity Activated Crosswalk (HAWK) signals, or pedestrian signs. 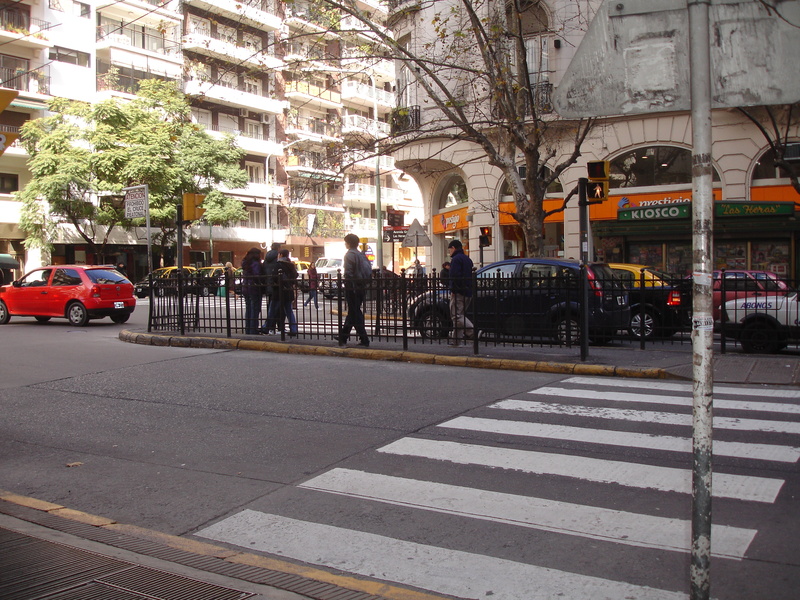 Intersections and marked crosswalks are common places where drivers expect to see pedestrians. At unmarked locations, pedestrians crossing the street assume more risk and responsibility for avoiding vehicles. The Manual on Uniform Traffic Control Devices provides the national standards on when and how to provide markings, signs, and traffic signals along public roads including those related to pedestrians. 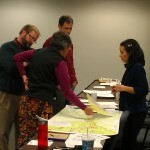 Several regional plans were reviewed and influenced the content and recommendations of this Plan including the Constrained Long-Range Transportation Plan (2011), Congestion Management Plan (2014), Roanoke Valley Conceptual Greenways Plan (2007), Bikeway Plan (2012), Route 419 Corridor Plan (2010), and the Study on Pedestrian Access to Commercial Centers (2006). Local plans were also reviewed to identify adopted policies, recommendations, and projects related to pedestrian facilities. This review encompassed a wide variety of planning areas from locality-wide comprehensive plans to plans for village centers and neighborhoods. Staff looked for references to each of the 12 topics listed below. A matrix of the topics referenced in the plans can be found in Table 1. Bicycle Accommodation: Plan identified a need for bike lanes, bikeways, bicycle safely, sharrows, or off road path specifically for bicycle use. Crosswalks: Plan identified the need for a crosswalk at specific locations; general statement about the need for crosswalks. Design Guidelines: Plan made reference to Federal, State, or local design guidelines or plan recommended the development and adoption of guidelines related to pedestrian needs. Intersection Improvements: Plan identified the need for improvements at specific intersections; plan made a general statement about the need for intersection improvements related to pedestrians. New or redevelopment required/suggested improvements: Plan identified a requirement, either adopted or recommended, for new development to include provisions for pedestrians and/cyclists. Pedestrian Safety: Plan identified a specific or general reference to improving pedestrian safety. Sidewalk: Plan identified a need for sidewalk installation or improvements at specific locations or made a general statement about the need for sidewalks. Streetscape: Plan identified a need for streetscape improvements at specific locations or made a general statement about the need for streetscapes (trees, signage, benches, lighting, etc.). Traffic Calming/Speed Reduction Measure: Plan identified a need for traffic calming or speed reduction at specific locations or made a general statement about the need for traffic calming. 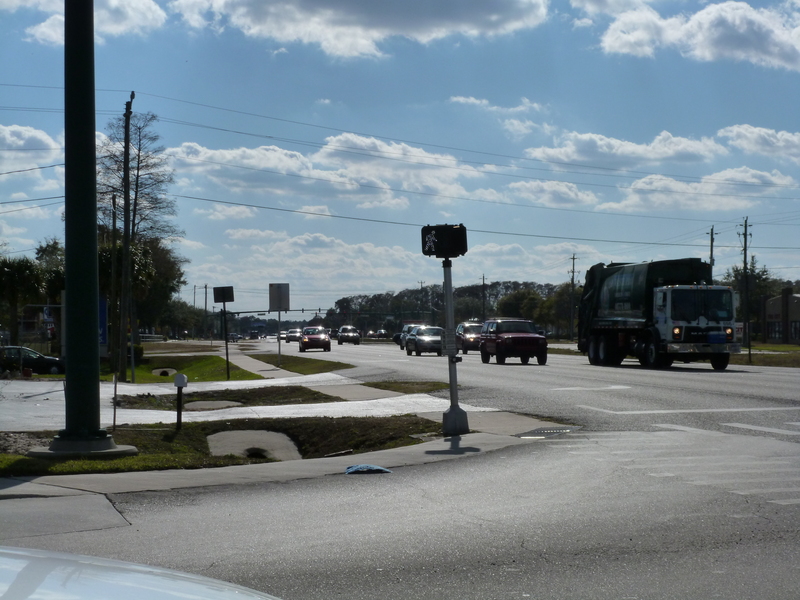 Traffic Signal: Plan identified a need for traffic signal improvements at specific locations or made a general statement about the need for pedestrian signals. Trail/Greenway: Plan identified locations for trails/greenways or made a general statement of need for additional trails/greenways. Village Centers Adopted or Proposed: Plan recommended an area to be considered a village center or similar small planning area. Local zoning and subdivision ordinances are local government tools to regulate land development. 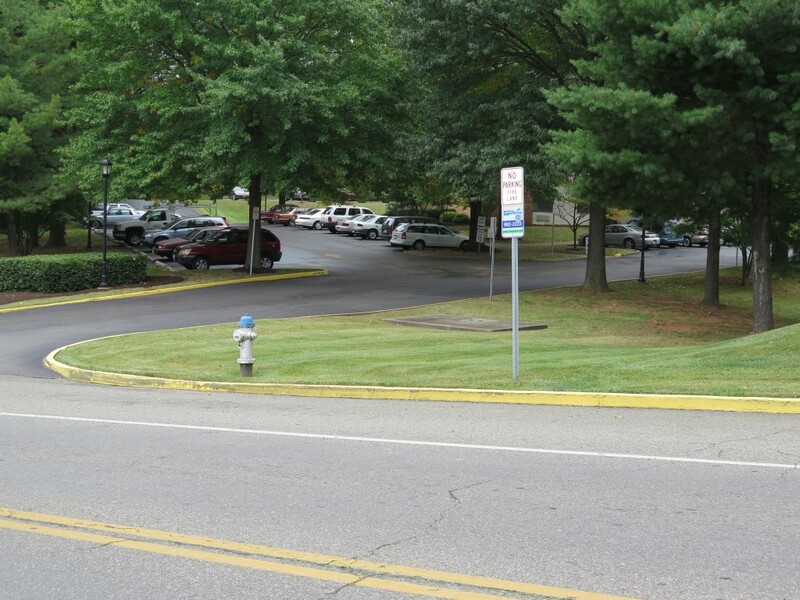 Such ordinances for local governments in the Roanoke Valley were reviewed to identify adopted regulations related to pedestrian facilities. A list of the ordinances reviewed is below followed by the findings from the ordinance review. The purpose of this review is to help local governments identify where improvements in their ordinances can be made to better accommodate pedestrians and provide examples of language from other local governments in the region. Many local, state, and national references exist to help guide the design of new infrastructure in coordination with the adjacent land use and development density. The following is a sample list of resources. There are many more pedestrian infrastructure needs than those identified in the Regional Pedestrian Vision Plan. The Plan demonstrates the regional backbone infrastructure needed for pedestrian transportation in the Roanoke Valley. Local governments are encouraged to use the regional pedestrian transportation network to further explore the needed local pedestrian transportation connections within each of the multimodal centers and districts and to future developments as they arise near such multimodal areas and corridors. In particular, further identifying local connections to schools, libraries, bus stops, healthcare facilities, grocery stores, and shopping centers are recommended. A pedestrian transportation system should be accessible to people of all ages and abilities. However, the Roanoke Valley is home to many well-established trail networks, including an outstanding and growing system of greenways. And the Roanoke Valley Conceptual Greenway Plan includes ADA-compliant and non-compliant facilities. 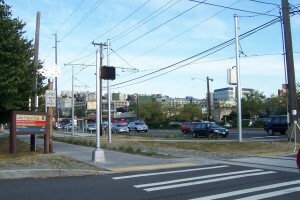 Many of the facilities, both existing and proposed, provide logical connections to the pedestrian transportation system. Due to the regional significance of the Greenways, the Roanoke Valley Conceptual Greenway Plan, as amended, is included by reference in this Pedestrian Plan. Accommodations which are intended to be compliant with the Americans with Disabilities Act (ADA) are listed in the following tables. Citizen input, previously adopted plans, and technical staff input contributed to these transportation infrastructure recommendations. The prioritization of projects was considered both regionally and locally. The highest priority pedestrian transportation projects are those that are located within multimodal centers because that is where the greatest concentration of residents and employees are located. One of the criteria for defining multimodal centers was trips within that area could be accomplished by roughly a 10-minute or less walk. Medium priority regional pedestrian projects are those located within multimodal districts because it is within these areas that traveling without a car is or should be possible. Walking is a critical component of being able to travel without a car, especially when accessing transit for longer distance trips. As such, pedestrian transportation projects within multimodal districts are given a medium regional priority. Outside of multimodal districts, the population is less dense with less mix of land uses; walking for transportation is less likely due to the longer distances and increased travel time. For these reasons, pedestrian transportation projects outside of multimodal districts are low regional priorities. The recommended improvements are grouped into three categories: intersection, hard surface, and streetscape. The three categories are general to allow for further detailing of improvements during project development and design. The three categories can broadly be described as follows. Intersection recommendations are noted in the maps with a line which indicate complete intersection or point locations, not necessarily direction of travel or precise improvement location. These locations denote where pedestrians are likely to cross the street, the existing infrastructure is insufficient, and as a result, some type of improvement is needed. The appropriate accommodations at each of these locations may involve different elements. In cases where the recommendation is related to accessing transit via one or a pair of bus stops, these locations are unique in that they represent where a transportation mode change occurs and a pedestrian becomes a transit rider and vice versa. For some bus stops, the improvement could involve moving the bus stop to a more accessible location. All intersection recommendations need to be accessible for people with disabilities and needed accommodations may include curb ramps, crosswalks, pedestrian refuges, pedestrian signals, signage, bus stop landing pads, benches, shelters, etc. 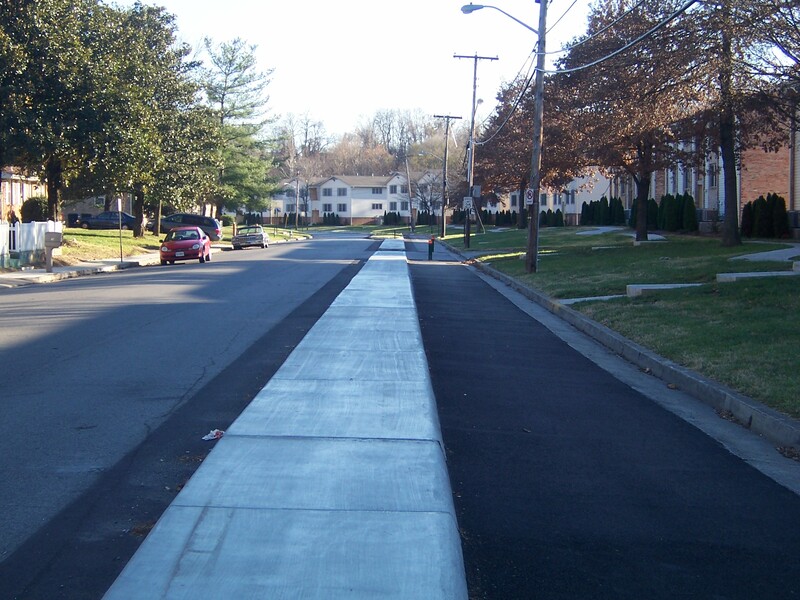 This Plan provides hard surface recommendations for transportation accommodations that are accessible to people with disabilities (compliant with the Americans with Disabilities Act) and entail a hard surface that is stable and slip resistant. The most common hard surfaces are concrete and asphalt though other materials could be used to accomplish an ADA compliant facility. Hard surface recommendations may be provided in common terms such as sidewalks, greenways, and shared-use paths. Accompanying each hard surface recommendation, where feasible, it is desirable to plant trees along the accommodation to provide shading. Where possible, accommodations should be separated from vehicle traffic by means of a planting strip along roads or located completely off-road. Streetscapes typically include more amenities than simply a hard surface accommodation. Streetscapes have a greater relationship with the adjacent buildings and may include amenities such as wider walkways, benches, landscaping, trees, tree wells, on-street dining or shopping spaces, trash receptacles, etc. More information regarding each recommendation is included in the “Description” column of the tables. Maps showing the recommendations are provided in tables, maps, and an Interactive Proposed Accommodations Map. It is possible that not all recommendations are displayed on the maps. Therefore, the maps should be used as a reference and the tables as the complete listing of recommendations. 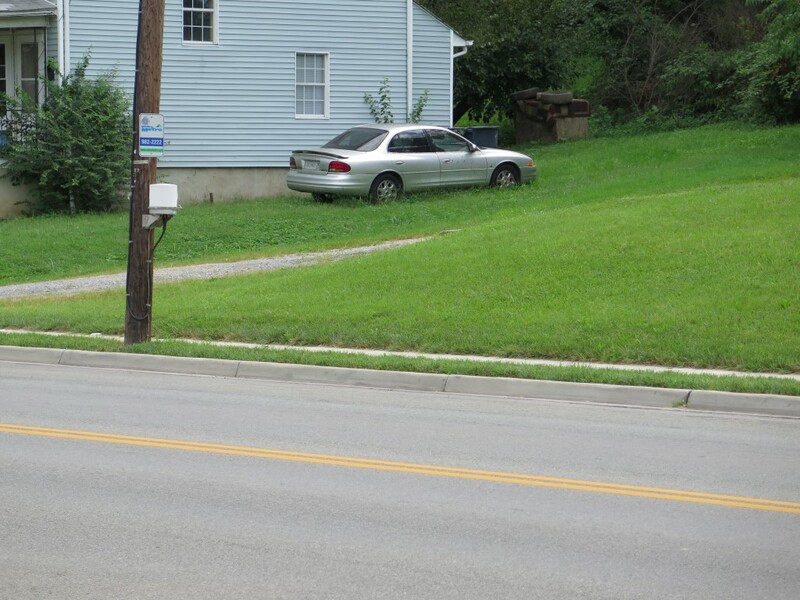 The following pictures provide examples of how pedestrians are creatively being accommodated in the Roanoke Valley and in places around the world. 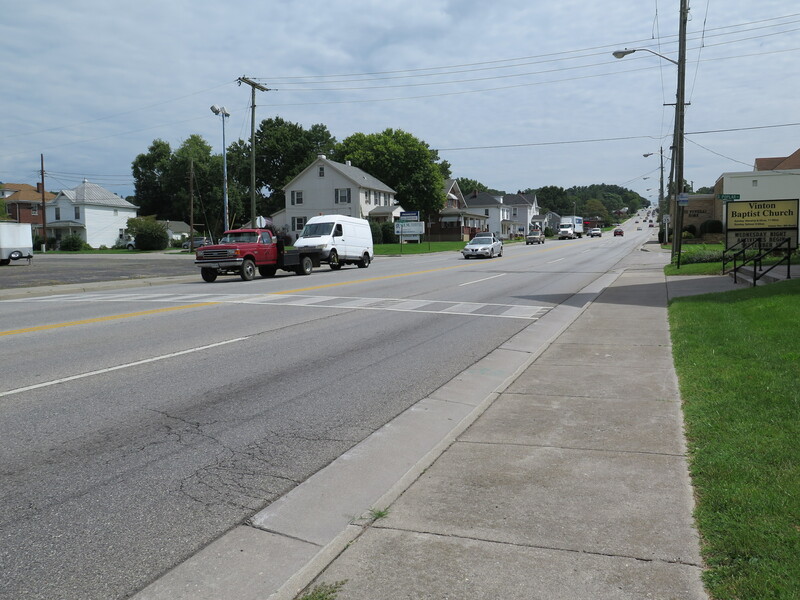 Opportunities to improve the walking, waiting, and crossing spaces for pedestrians are present in all upcoming infrastructure projects planned along roads, off-road, or on private properties in the Roanoke region. Working with designers for both public and private improvements to incorporate pedestrian accommodations into every design will go a long way to making safer places for people to walk. Possibly the greatest challenge to any transportation project is securing the funding for design, right-of-way acquisition, and construction. 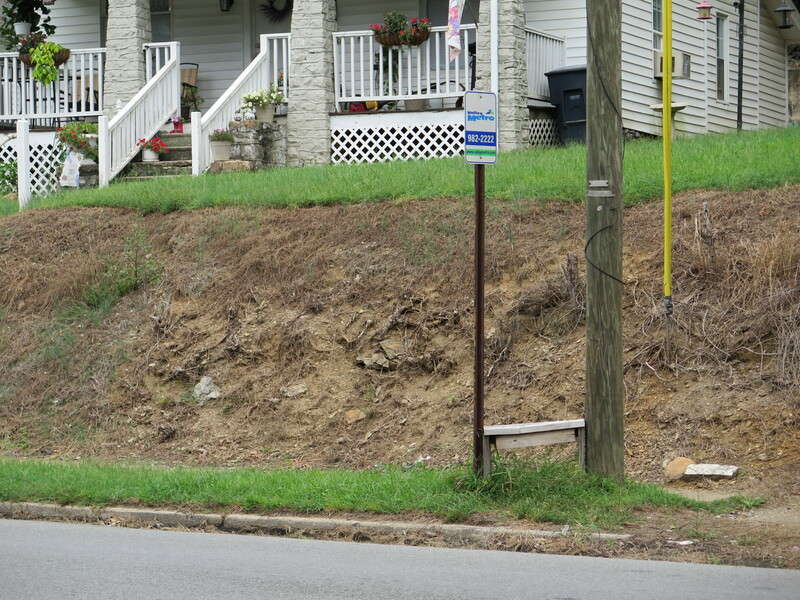 In Virginia, projects are identified in the Commonwealth Transportation Board’s Six-Year Improvement Program (SYIP) which allocates the funding for any surface transportation project. In developing the SYIP, each year, local governments work with citizens, transportation agencies, and other stakeholders to identify the projects that will help the locality, the region, and the Commonwealth achieve its goals. All projects receiving state or federal funding are listed in the SYIP. Another document, the Transportation Improvement Program (TIP) is a 4-year financial program that lists the transportation projects within the RVTPO region that will utilize federal funds. The TIP reflects the projects and priorities identified in the RVTPO CLRMTP. The TIP is approved by the RVTPO Policy Board every three years but amendments and adjustments occur continuously as new projects are added or existing projects are modified. Within the government, the following programs exist to fund pedestrian infrastructure. One of the simplest ways to accomplish pedestrian accommodations is for local governments to require developers to build the necessary infrastructure at the time of construction. This is especially important in areas where pedestrian traffic is likely to occur based on the surrounding current or future land uses. The multimodal centers and districts already identified by the region are a good starting point for identifying places where pedestrian accommodations should naturally occur with new development. A number of strategies have been identified that will guide the region as it works towards accomplishing each goal and ultimately its vision for a more pedestrian-friendly Roanoke Valley. The following tables correspond to each goal. They list the related strategies, the responsible parties for implementing the strategy, the expected output of the strategies, and the ultimate outcomes. Measuring the success of investments and actions has become a state and national priority as they relate to meeting goals and desired outcomes. 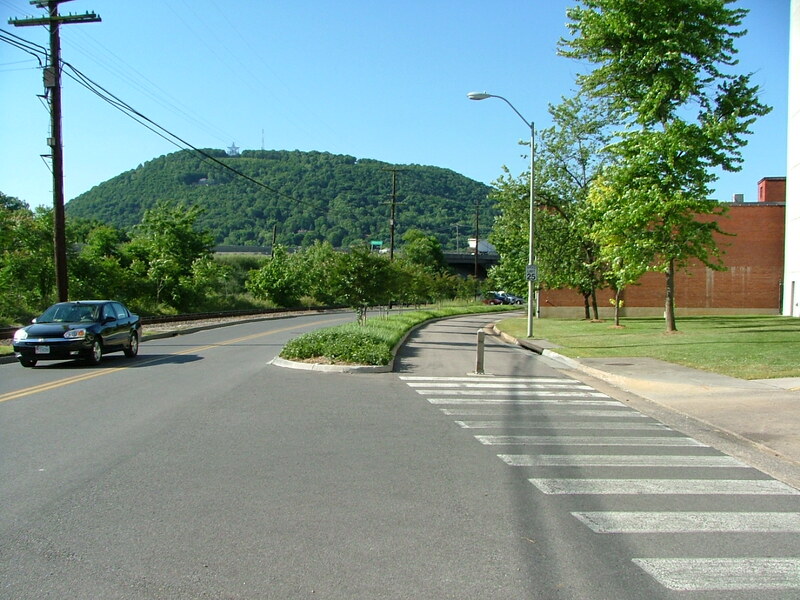 The Roanoke Valley TPO, as part of its typical Work Program, tracks several performance measures, many of which relate to the vision and goals of the Pedestrian Plan. Those measures are listed according to their tracking number in parentheses. In addition, new measures are recommended in addition to existing measures, which will aid in the measurement of progress. The Regional Commission, as staff to the RVTPO, will be responsible for coordinating data tracking among regional and local staff. Goal #2: Enable INDEPENDENT MOBILITY, particularly within Multimodal Centers and Districts, where people do not have to rely on vehicles to get from one place to another. Walking is an easy decision because it is a pleasant experience. Goal #3: Create a region where ACTIVE LIFESTYLES are the norm because our land use decisions and investment in pedestrian infrastructure complement each other and enable a natural tendency for people to walk every day. As a result, people feel healthier, more socially-connected and happy living and working in the Roanoke Valley.